Assist Trinity River Lumber Company, Schmidbauer Lumber Company, and North Fork Lumber Company’s timber management team. This position will be based at Trinity River Lumber Company’s site in Weaverville California. Timber appraisal and acquisitions from private and public sources. Timber sale contract administration, including logging, road construction, professional services and miscellaneous sale agreements. Monthly log yard physical inventory and supervision. Effectively maintain log cost, log flow and log inventory records. Professionally interact with State and Federal regulatory agencies and mutual business professionals. Represent the company in a professional and positive manner. 5 Years of Forest Management experience, preferably in California. California Registered Professional Forest License preferred or the ability to qualify for the RPF exam within two years. Knowledge of THP preparation and the California Forest Practice Rules. Understanding of logging, road construction and reforestation operations. Ability to set priorities, meet goals and objectives. Positive demeanor and ability to lead and/or function within a team. Proficient computer and math skills. Demonstrated ability to effectively solve problems. Trinity River Lumber Company is committed to EEO/AAE. Must have the ability to work in a fast paced environment, working safely and as a team player. Must be punctual and reliable. Must have reliable transportation and the ability to pass random drug test. 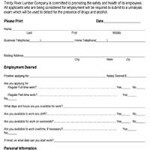 Trinity River Lumber Company offers competitive wages, health benefits and 401K. Applications will be accepted until the position is filled, at The Smart Business Center, Weaverville, 530-623-5538, thesmartcenter.biz. Trinity River Lumber Company is committed to EEO/AAE. An experienced millwright with a minimum of 3 years’ experience in industrial related maintenance and fabrication. Experience with various sawmill operation systems preferred, including the ability to trouble shoot electrical, mechanical, hydraulic and pneumatic applications. Please click the link below for an application. *Women, minorities and individuals with disabilities are encouraged to apply. Trinity River Lumber Company is an Equal Opportunity/Affirmative Action Employer, *including vets and disabilities.